I’m Running the Marine Corps Marathon! | Fit Girl. Happy Girl. 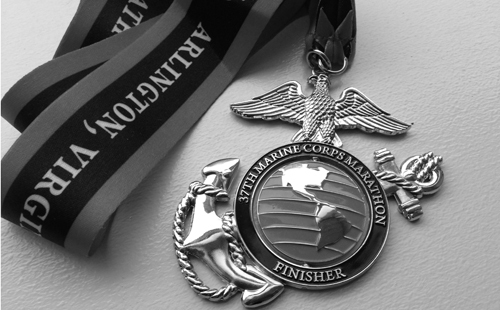 I’m Running the Marine Corps Marathon! Last night I went to see the special theater-showing on The Spirit of the Marathon II. It did not fail to inspire, make me laugh, bring a tear to my eye, and bring the marathon itch roaring back to me. So, I find it extremely appropriate to announce today my plans for my next running move. I’m running my second marathon this fall at the Marine Corps Marathon in Washington, D.C. on October 27! Honestly, I knew it wouldn’t take long for me to become addicted to the marathon distance. I’m kind of type-A when it comes to this stuff and mildly addicted to the adrenaline/endorphin rush you get when you finish a marathon. When I crossed the finish line at Big Sur, the race director told me it would change my life, and it sure did. So when the opportunity to run Marine Corps with the Runner’s World Challenge presented itself, there was no way I could say no. This will be my third race with the Runner’s World Challenge and I honestly couldn’t imagine running a major race without it. This is going to sound like a shameless plug right now (and it totally is) but Runner’s World Challenge is such a good program. Through the Challenge, you get guaranteed race entry to one of our event races- this year it was Disney, Big Sur, and Marine Corps. You also get a customized training plan to meet whatever goal your little running heart desires, as well as direct access to the Runner’s World experts. But the best part of Challenge is the V.I.P. treatment you get on race day. We have our own prerace and postrace tent filled with food and drink for days, and (probably the best part) we have access to our very own port-a-potties, so you can say goodbye to pre-marathon bathroom lines. You also get to run with the editors (like me!) on race day! Besides this being my second marathon, me being the type-A person that I am, I want to improve on my finish time. I finished Big Sur in 4:33, which for my first marathon and such a tough course, wasn’t too bad. But I want to do better. So, I’m setting a goal of breaking 4:15 and following a plan to help me do so. This is ambitious because it means PR-ing by more than 15-minutes but I think given the course at MCM and the typical weather, it’s possible. I’m going to focus much more on maintaining my strength training and speedwork that I’ve become really consistent with during my time off from training. I also want to focus on my diet more during this training cycle. I didn’t have issues with it last time but I think I need to actively add more protein into my daily diet and just focus on trying to eat clean. All of these goals pale in comparison to the reason I’m really excited to run Marine Corps which is my parents are going to be there! They have been at almost every race I’ve run since I started running in March 2012 but were not able to come out to California to see me finish Big Sur. But my mom has assured me she’s already booked the hotel for MCM and they will be there, on the course, to cheer me on at my second marathon. I’ve also heard MCM is a great race because of the military presence and patriotism throughout the entire weekend. While we don’t have any Marines in my family, my grandfather was a Navy and Coast Guard veteran and my cousin’s boyfriend (who’s basically part of our family) is also a Coast Guard veteran and my dad is in the Air Force auxiliary. The military has always been a part of my family’s life so I think running MCM will be a great way to honor that tradition. While I will never forget my experience at Big Sur, it was my first after all and you never forget your first, I have a feeling Marine Corps is going to be really special. Training begins on July 8, let’s do this! Awesome! I’ll be there running with the Challenge group (my first marathon – eep!) too. Enjoy your training cycle! Fantastic! Can’t wait to meet you. Best of luck with the start of your training! Good luck training through the summer, it is not for the weak willed, thats for sure. I am in week six of training for the Lehigh Valley Health Network Via Marathon in September and it is really starting to get brutal with the Charleston heat. Hoping you will keep me inspired to get through!! That’s really awesome! I can’t wait to read up on your experience participating in the MCM. You are truly an inspirational runner and person. Good luck at your second! I bet you can break 4:15 :) Will be keeping fingers crossed for you! I just came across your blog today and am thinking of looking into Runners World Challenge. I’m doing my second half in September and have vowed to do my first marathon next year (before I turn 40). Good luck with your training! Congrats on signing up! I ran MCM last year, and although it wasn’t my fastest or best race, I think it was my favorite marathon of the 5 I have run. My mom and brother were there with me too and it was special :) I hope you have a wonderful experience. I’d love to run a race through the Runner’s World Challenge one of these days. Good luck with your training. Can’t wait to see you in Oregon! I’m going to be running MCM too! This is my favorite race. You will love it! MCM will be my first marathon! My parents are traveling to support me too… and my husband, kids, sisters… I can’t wait. Like you said, running goals aside it will be so special to have family there! I think it is going to be an emotional day and I can’t wait.